What did Willa want for her 9th birthday? It certainly wasn’t a slow-smoked Texas-style brisket. That was what her dad wanted. 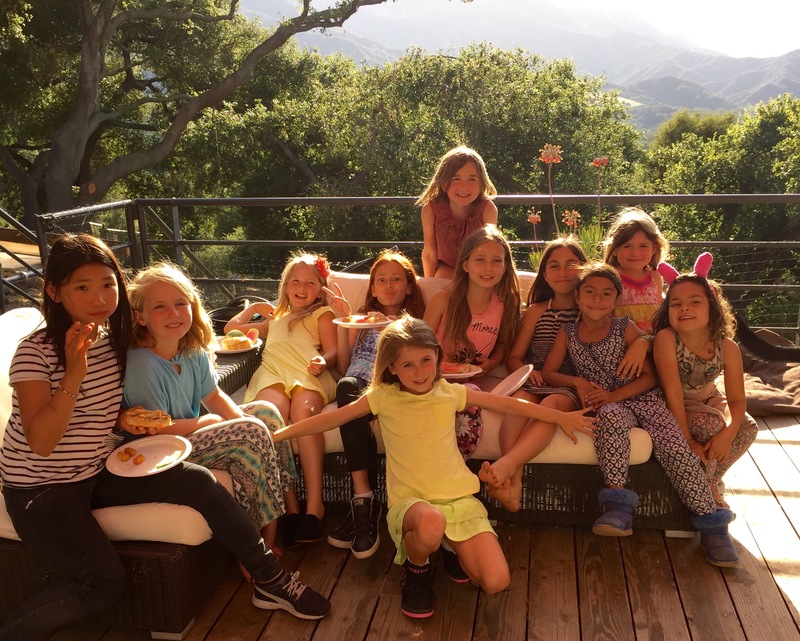 Willa and her birthday posse — whoa, that’s a lot of girls! While planning birthdays for my children, I like to remember that were it not for me, they wouldn’t be here. So in some ways, it’s a day to celebrate me, too! Imogen got to go to Fenway Park and watch the Red Sox play the Orioles on her 5th birthday. She was initially disappointed when I told her, until I informed her should could have any kind of sweet she wanted. “Yayyy!” she said. Go Red Sox. Willa’s main concern was mochi. “Do you mean you want mochi instead of cake?” I asked, hopeful. Yes, it turns out, that was what she meant. Relieved that I would not be asked to use mochi in my party food, I set about thinking what to make. There would be a lot of people here, and I wanted to keep it relatively simple. 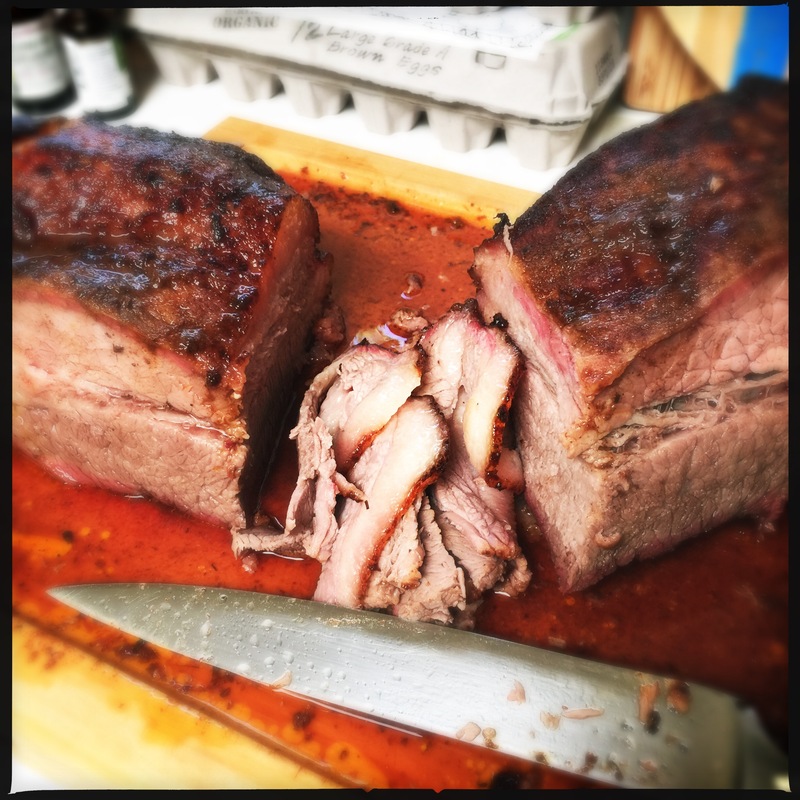 I landed on the idea of a Texas-style smoked brisket, which I hadn’t made since the previous year’s Memorial Day. One of the best parts about cooking a brisket is that it takes all day. It’s the definition of slow food. You have to wake early, get your fire burning and then smoldering, set up your smoker, put the meat on. And then wait. And wait. And wait wait wait wait. Even though it’s still morning and the brisket has been smoking already for three hours, you may feel like having a beer. I encourage you to follow that feeling. It’s what that ol’ dude in Texas waiting on his porch would do. The brisket was still smoking when guests arrived, and removing it from the smoker and carrying it through the hushed crowd into the kitchen was a moment of triumph. I served the brisket sliced on soft rolls with pan drippings and a spicy pickle cole slaw. Another of the best parts of cooking a brisket is the leftovers — and, in particular, brisket tacos. I pre-slice the leftover brisket and freeze it. And then whenever the mood strikes, I chisel off half a pound or so and make some brisket tacos. If I was a food truck kinda guy, I’d strike it rich. Willa saw me working on my post, read the title, and said, “Dad, it wasn’t my brisket!” She pointed out that she didn’t even eat any of it. I reminded her that she wasn’t the only one who got to take credit for the glory of her existence. I was there at the conception! The night before, mix together all ingredients except brisket and beer to create a rub. Sprinkle the rub all over the brisket until it is well covered, and brush it lightly with your hands to evenly distribute. Place in a large dish, cover with foil and set overnight in the fridge. In the morning, place the chunks of hardwood in water and heat hardwood coals in a smoker or a deep barbecue. (You can also smoke your brisket in a gas grill at a very low temperature, but you will need to add wood chips frequently to get smoke flavor.) You want a temperature of about 200-250. When coals are hot, place the brisket on the grill, place a chunk of soaked hardwood on the coals, and cover. You want the brisket far enough from coals that it is not getting direct heat — if you are using a barbecue and not a smoker, push the coals to one side and cook the brisket on the other. You will continue to monitor, adding coal and hardwood (or wood chips for a gas grill), for the next 8-9 hours, keeping a constant temperature between 200-250, until the brisket is fork tender. For the last hour, place the brisket on a large sheet of heavy duty foil, and pour a bottle (or can) of lager beer over and around it. Wrap the foil up around the sides (use a second sheet if you need it) and tuck over, enclosing the brisket with the beer inside as a marinade. Smoke for another hour and remove, catching beer/brisket juices in a bowl as you remove the brisket. With a very sharp knife, thinly cut the brisket across the grain into slices. Drizzle beer juices over the top. Serve in sandwiches, sliced white bread and cole slaw, or as tacos in toasted corn tortillas with onion slices and a tart smoky salsa. Does Mom who was responsible for the lions’ share of producing Willa get a vote? Not me Mom, Leslie, Mom. 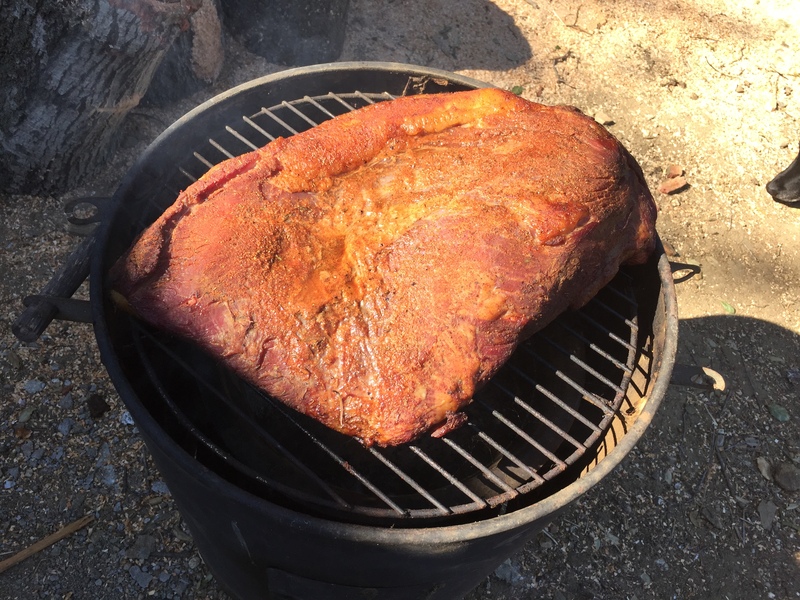 Loved reading this one… greatest line: “Even though it’s still morning and the brisket has been smoking already for three hours, you may feel like having a beer. I encourage you to follow that feeling.” I’ll have to share this recipe with Tanner and his brothers. They’ll love this! Ella! You need to get Tanner right on that! (And then invite us over for dinner! 😉 One of the girls I had working your wedding with me got so inspired she’s making her own basturma! Here’s to slow food. Looks amazing! I will attempt this someday!